In case you missed it, a man with a current, valid California driver’s license and a perfect driving record spanning forty years was denied a license renewal in Wisconsin last week because he doesn’t have hands. 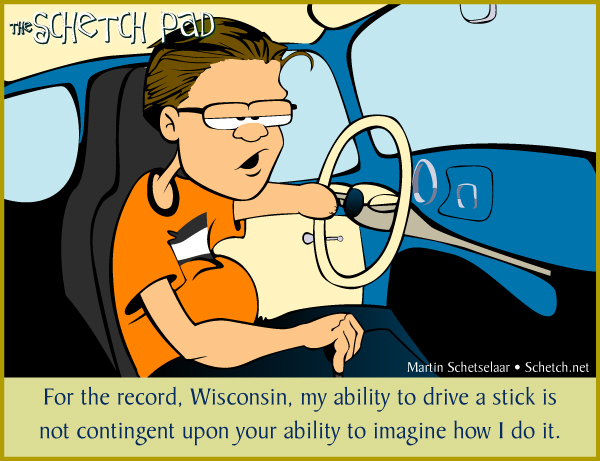 Over on LivingOneHanded.com, Ryan pointed out that, living in Wisconsin as he does and having the same amount of arm as I have, he’s not allowed to drive a stick or anything without power steering. Of course, I’ve been driving vintage Volkswagens (manual transmission AND armstrong steering) since ’95, and the only accident I’ve had was getting rear-ended when I had to brake suddenly to avoid rear-ending a dipstick in too big of a hurry. As you maybe can imagine, I’m a bit worked up about this one. Am I Taking This Too Literally?